Mike is the winner of Round 36. He’s been retired 4 years, following a remarkable career as a primary school headteacher. 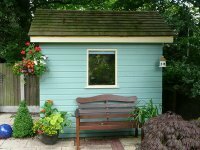 His avatar is a photo of his “studio,” or, as his wife calls it, his “writing shed.” He built it just prior to retiring, and it’s his pride and joy. If he’s not in the studio, you’ll find him at his local coffee shop, pen in hand.